We've made the service simpler and more intuitive so you can find the information you need quickly and easily. The ukphonebook.com home page opens with our basic telephone number search where you can find UK residential and business phone numbers. Find a person? Company search? TPS check? All search options can be found down the left hand side of the page. 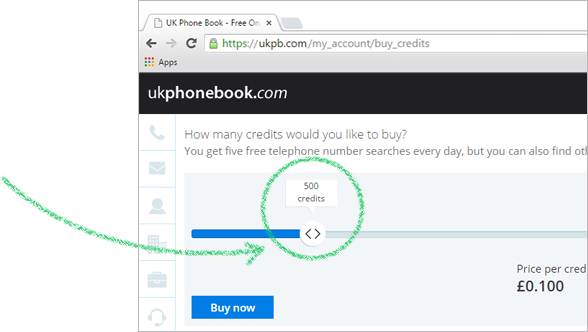 Users no longer have to differentiate between free and paid credits - there’s just one credit type. Use the sliding scale to select the number of credits you'd like to buy. Don't worry, you still get your 5 free telephone searches per day! We've fully integrated Land Registry information with our other data sources. Land Registry allows you to verify property owners and download Title Deeds and Plans. You can also identify unknown owners from Title Deeds, check if there is a mortgage on a certain property and identify the owner or landlord of a property.